There’s something raw about gardening. It’s the dirt under your fingernails, the smell of the earth, and the feeling of watching something grow that you nurtured. It feels good to watch a plant grow taller or to see a little sprout stick up out of the soil. However, the process of gardening is just as important as the product. First of all, you have to be bad at something before you’re good at it; you’ll need to develop your skills as you build your garden. It’s also a great activity for your body as well as your mind. It’s also a helpful activity for the world around us. And, finally, you might grow something — but you won’t know until you try. If you are worried about gardening and not growing anything, chances are you’re new to gardening. If you are, that’s all the more reason you should be doing it. Gardening is a chance to try something new and learn through the process. Even if you’re not growing anything, you’re learning what you did wrong and how to do better. You’ll begin to understand the difference between each plant, its needs, and the many factors that go into how a plant will grow. You’ll discover if you enjoy gardening food to eat, flowers to look at, or plants to add to your home. None of that is possible unless you try. Anyone who has tried to garden will tell you it’s no walk in the park — gardening is quite the workout. Whether you’re using the earth, raised beds, or planters, there’s a lot of physicality to it that makes it great for your body. You may not be taking a ton of steps while gardening, but your heart rate will reflect the work it takes to dig, lift, and plant while preparing a garden. Though it can be hard to track your activity while gardening, something like a wearable fitness bracelet will show how your heart rate reacts to the activity. It’s hard work, and even if nothing grows, you still helped your body by trying it. There are so many benefits that your mind and mental health can gain just from the act of gardening. For one, being outside is highly beneficial. For people with seasonal affective disorder, for instance, part of the struggle can be getting sunlight and getting outside. 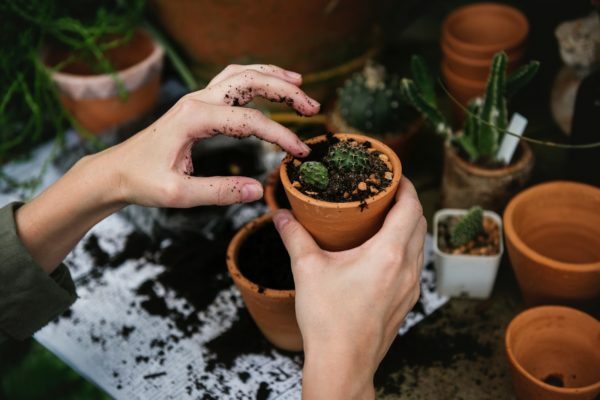 Gardening can offer that, and it can also be done all year round, depending on what you’re growing and how you go about doing it. You’re also creating something, which can be great for mental health in general. Even if you don’t get anything to grow, the act of putting soil in pots, watering it, and working towards growth can do wonders for your mind. You’re not going to save the world just by gardening, but small changes do matter. There are so many benefits to gardening for the world including gardening to help the bee population, creating sustainable food for your home, eliminating more waste by composting, or even recycling items for planters. Just be sure you’re being a responsible gardener by making sure you’re planting things that are not harmful to neighborhood cats, being sure to use natural fertilizers, and making sure you’re not overwatering. How do you know you won’t grow something? Many plants are inspirational in that they can grow despite all the odds. Some are more finicky, but life has a way of working out a lot of the time. What if it’s you that grows, even if your plants don’t? Ecotherapy can create a lot of positives for our mental health. Even if the plants don’t grow, but you gain something from it, that would count as a win. Gardening is a process that sometimes works and sometimes doesn’t, but you won’t know if something will grow unless you plant it, water it, and give it some sun. There are so many people that don’t have a green thumb, but the ones who do will tell you that it comes with a lot of work. Just know, if your thumb isn’t green yet, that doesn’t mean it won’t be later. Giving it a try is beneficial to your body, your mind, and the world around you. Plus, you might even get something to grow. But even if you don’t, the journey is just as important as the destination.